“This is the single largest pool of money in Florida’s history designed to diversify and strengthen the economy of a particular region,” said Don Gaetz, chairman of the Triumph Gulf Coast board and a former state senator. Until 2033, the board will oversee distribution of funds to counties that extend nearly 240 miles along the Gulf of Mexico from Escambia in the west to Wakulla in the east. Pre-applications represent diverse goals. One such vision for Whiting Aviation Park was in place before the spill occurred. Santa Rosa County Commissioner W.D. “Don” Salter recalled that he received a call in 2003 from Commodore Terrance “Rufus” G. Jones, Naval Air Station Whiting Field’s training air wing commander. The two men discussed the need to advance the county’s economic development objectives while providing a buffer between the NAS and activity that could hinder missions. The job of training Coast Guard, Navy and Marine Corps aviators requires an understanding partnership with the county and local communities — and it involves a lot of takeoffs and landings. “Last year’s 1.1 million flight operations exceeded those of Atlanta’s Hartsfield Airport, which came in at 870,000,” said Julie Ziegenhorn, NAS Whiting Field’s public affairs officer. “It’s the crown jewel of our county,” said Erica Grancagnolo, grants and special programs manager for Santa Rosa County. Indeed, it delivers more than $1 billion in annual economic impacts, according to Shannon Ogletree, director of the county’s economic development office. 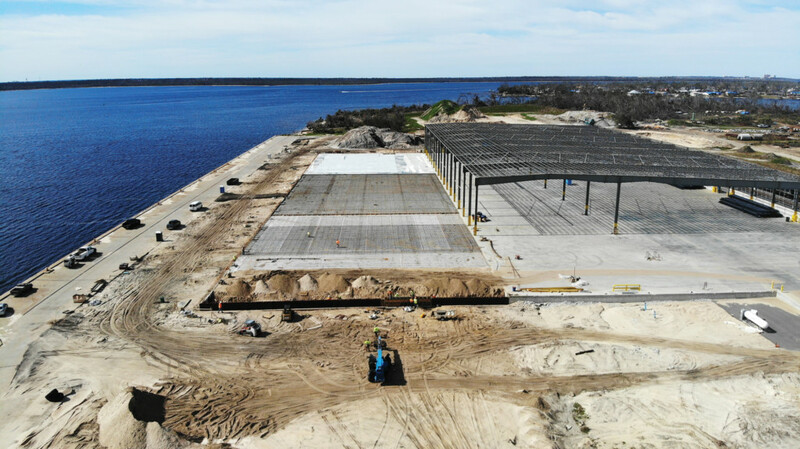 Salter became convinced that the maintenance and repair needs of the NAS merited an aircraft repair facility just outside the fence, one that would create high-paying jobs for Santa Rosa County residents. Studies had demonstrated that commuters increasingly were accepting jobs outside the county. Salter believed that a jobs-generating repair facility might also help prevent a base closure. The project was conceived as Whiting Aviation Park. Salter’s experiences in Vietnam as a combat platoon sergeant and Army paratrooper from 1965 to 1968 helped him deal with a prolonged battle. Conversations and negotiations among the county, Navy and Pentagon consumed six years. In 2009, the U.S. Navy granted shared use of the NAS Whiting Field’s south runways to enable access to a 288-acre county-owned property zoned for aviation industry. With the limited-access use agreement in hand, the county developed a master plan and economic strategies to bring jobs and related aviation industry entities to Santa Rosa County. But the plan relied upon funding from the state. “Every time the proposal reached the governor, it was vetoed,” Salter said. Then came the Deepwater Horizon oil spill and the damages award. Fast forward to November 2017. Salter et al submitted a Whiting Aviation Park project pre-application to Triumph Gulf Coast Inc. In 2018, funding in the amount of $8.52 million was approved, and the project was in a position to take wing. The awarded money will help pay for Phase I infrastructure, roads and utilities. Triumph Gulf Coast Inc. administers the distribution of funds to Escambia, Santa Rosa, Okaloosa, Walton, Bay, Gulf, Franklin and Wakulla counties. Its seven-member board created a pre-application process, which provides for the initial consideration of projects capable of diversifying the regional economy and adding attractive jobs. Before funding is approved, the board must be satisfied that a proposal complies with its objectives and lends itself to provable measures of success. The board also ensures that a proposed project is not one that ordinarily would be funded entirely by local units of government. “Ideally, we want to be the junior partner. We want to provide less than half the money, and then only if necessary,” Gaetz said. The board also concerns itself with return on investment. Gaetz described the board’s decision-making process as first, conceptual approval, followed by specification of terms for the award of the money. Then, a legally binding contract is developed between a responsible party and Triumph Gulf Coast. It includes a performance schedule enforceable in court. If an application is denied, the board may help applicants make their proposal better fit Triumph Gulf Coast criteria or it may refer them to other sources of funding. Other projects remain in the pre-application phase. Some are expected to be withdrawn or significantly modified due to the impacts of Hurricane Michael. Willie Pollard’s initiative in Bay County was suspended after the hurricane. An insurance agent and president of the Bay Youth Summer Work Foundation, Pollard sought $40,000 and cleared the pre-application phase. But, by his own request, the review process was put on pause by the Triumph board while Pollard focused on his business, the Willard Pollard Insurance Agency, and helped clients recover. The foundation’s summer work program was designed for high school students, ages 16 to 18, who are in good standing academically and in the community. The project helps students continue their education, find work and ultimately improve their future prospects for employment. “In Bay County, 59 percent of students receive free or reduced lunch, and approximately 61 percent of households with a family size of four live below the national poverty level in earned annual income,” Pollard said. The foundation’s eight- to 10-week summer work program enables students to select an industry certification and take Gulf Coast State College classes online, while gaining work experience and making money. Students have worked jobs in areas including the insurance industry, law offices, church administration, and maintenance and real estate. Students pick a certification program from a list of more than four dozen and then complete internet-based classes on computers at the college. The Triumph Gulf Coast board continues to accept applications. “Probably the best ideas for diversifying Northwest Florida’s economy haven’t even been proposed yet,” Gaetz said.